K. Luger, T.J. Rechsteiner, and T.J. Richmond, Preparation of Nucleosome Core Particle from Recombinant Histones. L.M. Carrthers, C. Tse, K.P. Walker III, and J.C. Hansen, Assembly of Defined Nucleosomal and Chromatin Arrays from Pure Components. J.A. Alfieri and D.J. Clark, Isolation of Minichromosomes from Yeast Cells. D.J. Tremethick, Chromatin Assembly in Xenopus Extracts. A.J. Crowe and M.C. Barton, In Vitro Reconstitution of Nucei for Replication and Transcription. L. Chang, C.A. Ryan, C.A. Schneider, and A.T. Annuziato, Preparation/Analysis of Chromatin Replicated in Vivo and in Isolated Nuclei. M.E.A. Churchill, A. Changela, L.K. Dow, and A.J. Krieg, Interactions of High Mobility Group Box Proteins with DNA and Chromatin. Y.V. Postnikov and M. Bustin, Reconstitution of High Mobility Group 14/17 Proteins into Nucleosomes and Chromatin. R. Reeves and M.S. Nissen, Purification and Assays for High Mobility Group I(Y) Function. Assays for Nucleosome Structure and Function in Vitro. J. Bednar and C.L. Woodcock, Cryoelectron Microscopic Analysis of Nucleosomes and Chromatin. J. Griffith, S. Michalowski, and A.M. Makhov, Electron Microscopy of DNA-Protein Complexes and Chromatin. K.-M. Lee, D.R. Chafin, and J.F. Hayes, Targeted Cross-Linking and DNA Cleavage within Model Chromatin Complexes. A. Flaus and T.J. Richmond, Base-Pair Resolution Mapping of Nucleosomes Positions Using Site-Directed Hydroxy Radicals. S.I. Usachenko and E.M. Bradbury, Localization of Specific Histone Regions on Nucleosomal DNA by Cross-Linking. K.J. Polach and J. Widom, Restriction Enzymes as Probes of Nucleosome Stability and Dynamics. S. Pennings, Nucleoprotein Gel Analysis for Nucleosome Positioning and Mobility. Q. Li, U. Björk and Ö. Wrange, Assays for Interaction of Transcription Factor with Nucleosome. J.G. Moggs and G. Almouzni, Assays for Chromatin Remodeling During DNA Repair. K. Hirayoshi and J.T. Lis, Nuclear Run-On Assays: Assessing Transcription by Measuring Density of Engaged RNA Polymerases. Assays for Chromatin Structure and Function in Vivo. P.D. Gregory and W. Hörz, Mapping Chromatin Structure in Yeast. M.P. Ryan, G.A. Stafford, L. Yu, K.B. Cummings, and R.H. Morse, Assays for Nucleosome Positioning in Yeast. A. Hecht and M. Grunstein, Mapping DNA Interaction Sites of Chromosomal Proteins Using Immunoprecipitation and PCR. P.B. Meluh and J.R. Broach, Immunological Analysis of Yeast Chromatin. M.P. Kladde, M. Xu, and R.T. Simpson, DNA Methyltransferases as Probes of Chromatin Structure in Vivo. B. Suter, M. Livingstone-Zatchej, and F. Thoma, Mapping Cyclobutane-Pyrimidine Dimers in DNA and Using DNA Repair by Photolyase for Chromatin Analysis in Yeast. I.L. Cartwright, D.E. Cryderman, D.S. Gilmour, L.A. Pile, L.L. Wallrath, J.A. Weber, and S.C.R. Elgin, Analysis of Drosophila Chromatin Structure in Vivo. M.D. Biggin, Ultraviolet Cross-Linking Assay to Measure Sequence-Specific DNA Binding in Vivo. D. Pruss, I.M. Gavin, S. Melnik, and S.G. Bavykin, DNA-Protein Cross-Linking Applications for Chromatin Studies in Vitro and in Vivo. C. Crane-Robinson, F.A. Myers, T.R. Hebbes, A.L. Clayton, and A.W. Thorne, Chromatin Immunoprecipitation Assays in Acetylation Mapping of Higher Eukaryotes. G.P. Pfeifer, H.H. Chen, J. Komura, and A.D. Riggs, Chromatin Structure Analysis by Ligation-Mediated and Terminal Transferase-Medicated PCR. E.C. Strauss and S.H. Orkin, Guanine-Adenine Ligation-Mediated PCR in Vivo Footprinting. T.K. Archer and A.R. Ricci, Exonuclease III as Probe of Chromatin Structure in Vivo. S. Belikov, O. Preobrazhenskaya, and V. Karpov, Protein Image Hybridization: Mapping and Positioning DNA-Protein Contacts along DNA. K.S. Zaret, In Vivo Analysis of Chromatin Structure. G.L. Hager and G. Fragoso, Analysis of Nucleosome Positioning in Mammalian Cells. P.R. Kramer, O. Bat, and R.R. Sinden, Measurement of Localized DNA Supercoiling and Topological Domain Size in Eukaryotic Cells. W. Bickmore, Fluorescent in Situ Hybridization Analysis of Chromosome and Chromatin Structure. M. Gotta, T. Laroche, S.M. Gasser, Analysis of Saccharomyces cerevisiae Nuclear Organization. C.A. Mizzen, J.E. Brownell, R.G. Cook, and C.D. Allis, Histone Acetyltransferases: Preparation of Substrates and Assay Procedures. N.A. Barlev, J.L. Workman, and S.L. Berger, Analysis of Activity and Regulation of hGen5, Human Histone Acetyltransferase. P.A. Wade, P.L. Jones, D. Vermaak, and A.P. Wolffe, Purification of Histone Deacetylase Complex from Xenopus laevis: Preparation of Substrates and Assay Procedures. C. Logie and C.L. Peterson, Purification and Biochemical Properties of Yeast SWI/SNF Complex. P.D. Varga-Weisz, E.J. Bonte, and P.B. Becker, Analysis of Modulators of Chromatin Structure in Drosophila. R. Sandaltzopoulos, V. Ossipow, D.A. Gdula, T. Tsukiyama, and C. Wu, Purification of Drosophila Nucleosome Remodeling Factor. This volume of Methods in Enzymology includes up-to-date procedures used for the assembly of nucleosomes, chromatin, and nuclei, extending the classical procedures described nearly ten years ago in Volume 170 (Nucleosomes) of this series, and should assist in the further investigation of the ways in which the structural dynamics of chromatin contribute to geh regulation of transcription, replication, recombination, and repair. 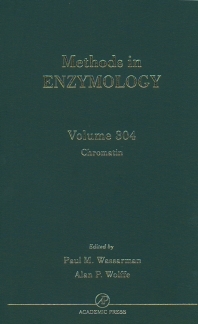 Also described in this volume are assay for the structure and function of in vitro reconstituted chromatin and for defining the organization and characteristics of natural chromosomal material from yeast (Saccharomyces cerevisae), flies (Drosophila melanogaster), and frogs (Xenopus laevis), as well as from mammalian tissues. The purification and assay procedures for various chromatin remodeling activities, including histone acetyltransferases, histone deacetylases, and SWI/SNF ATPases are detailed. The critically acclaimed laboratory standard for more than forty years, Methods in Enzymology is one of the most highly respected publications in the field of biochemistry. Since 1955, each volume has been eagerly awaited, frequently consulted, and praised by researchers and reviewers alike. Now with more than 300 volumes (all of them still in print), the series contains much material still relevant today--truly an essential publication for researchers in all fields of life sciences. Graduate students and research scientists involved in biochemistry, molecular biology, cell biology, genetics, developmental biology, and biophysics. Alan P. Wolffe is Chief of the Laboratory of Molecular Embryology and of the Section on Molecular Biology at the National Institute of Child Health and Human Development. He was educated in the UK, studying biochemistry at Oxford and completing graduate research with the Medical Research Council in London before moving to the United States. After a post-doctoral fellowship funded by the European Molecular Biology Organization at the Carnegie Institution of Washington, Dr. Wolffe joined the National Institutes of Health in 1988. His research interests include the earliest events in vertebrate development, with respect to the mechanisms through which nucleic acid binding proteins influence gene expression. National Institute of Child Health and Human Development, National Institutes of Health, Bethesda, Maryland, U.S.A.